View Poll Results: Which series are you most looking forward to? 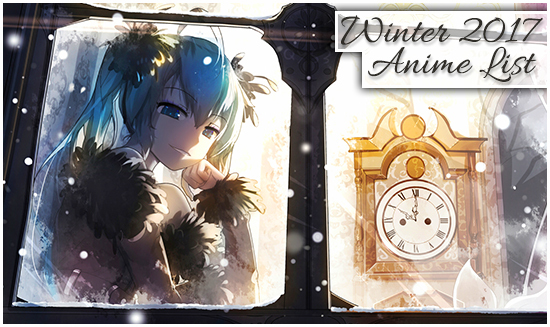 Here is the Winter 2017 Anime List! Everything is color-coded (OVAs/SPs/UEs/OADs, television series/shorts, and movies) so please keep that in mind as you're reading. The producing studio is listed in parentheses () beside each title as is the date it is scheduled to premiere. If additional details such as synopses, PVs, and trailers for a particular show are available they have been included in spoiler tags beneath that show. Also, if the number of episodes is known it will be included in brackets  after the date. NOTE: For video-related concerns (such as playback issues, net stream errors, missing episodes, etc) please contact Ceres or Kisae. NOTE: If you would like to have a title added to the OSpedia for the purpose of reserving and uploading it please contact mlcdl or FiQ5149. The OAD will adapt the mangaâ€™s 54th chapter (â€œFirst accident? ~Hajimete no~â€) and 55th chapter (â€œI think ~Ippo Mae ni~â€). The third of three compilation films. The adaptation will portray the â€œMost Evil Death Row Convictsâ€ arc in the manga. The arc features underground ring fighters in the no-rules combat environment of death row convicts. Two episodes related to the Bikini Warriors TV series. Episode one will focus on Hunter and Valkyrie who were guests characters in the television anime as well as two new characters: Cleric and Kunoichi. Episode two will focus on Fighterâ€™s party after they have overcome hardships, spoken with god, and earner the legendary bikini armor. However, the armor is only invisible to idiots. This OVA will feature the characters at a hot spring. The film will tell a prequel story before the events of the net anime series. The film will center around the HoneyWorks songs "Ima Suki ni Naru" (I'm Falling in Love Now) and "Sankaku Jealousy" (Triangle Jealousy). The film shares the same title as the musical group's third and latest album, which it released in July 2015. The first film was based on the "Kokuhaku YokÅ RenshÅ«" (Confession Rehearsal), "Hatsukoi no Ehon" (The Picture Book of the First Love), and "Yakimochi no Kotae" (The Answer to Jealousy) songs. The film's story is set in both an anime and a live-action world, and will contain live-action scenes in addition to the anime scenes. The OAD will center on Hijiri Minowa and will adapt the mangaâ€™s 40th chapter â€œMaid!!â€. The second of two episodes adapting the Zeno Arc from the eighteenth volume of the manga. Episodes 3 and 4 of 8 that function as the sequel to the Strike the Blood series. The story follows Arisa Minase, a cheerful, gentle girl who lives peacefully with her kind parents and older brother, and who has a lot of friends. The story starts on the night before Arisa's birthday, and she is eating cake with her brother when the clock strikes midnight. At the exact moment the clock strikes midnight, suddenly the ground opens beneath her feet and Arisa is taken to Wonderland where the inhabitants, who resemble people she knows in her world, all call her Alice. Arisa relives the same day in Wonderland over and over, and she must find the real Alice to be able to break the cycle and return to her own world. An episode bundled with the limited edition of manga volume four. The story begins the day before the graduation ceremony. 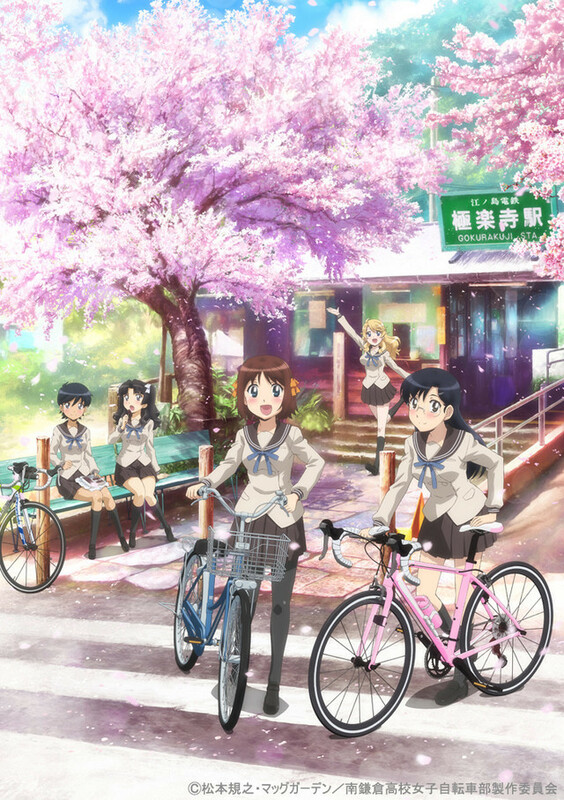 Five middle school girls each are preoccupied with their real everyday lives. These girls meet each other in a fantasy world after being sent there through a sudden occurrence. There, they learn about the impending crisis that this world is facing. The way to avert this crisis is for the five to collaborate and bring their five hearts together as one through dance. However, the five cannot come to love the world, and cannot tell their true feelings to one another, so their hearts are unable to unite. The time limit is fast approaching. Can the dance of the five girls save the world? And will they be able to graduate? The third episode in the eight episode series. The story is set in the year 2015, during the final era over which magic still held sway. The humanity survival and security organization Caldea was established to observe the world that can only be seen by magic and the world that can only be measured by science â€” as well as to prevent the final extinction of mankind. Thanks to the efforts of many researchers, the path of human history has been ensured for 100 years into the future. However, without warning, the realm of the future that was under constant observation by Caldea vanished. The extinction of humanity in 2017 was observed â€” no, confirmed. The first of two Koutetsujou no Kabaneri compilation films. Saber Marionette J: Last Story OAD (AIC) - 12/?? The main Saber Marionette J series is set in a world with no women, only female androids that can perform limited human interaction, called Marionettes. One day, a boy named Otaru Mamiya discovers a "Saber" model Marionette called Lime, equipped with a special chip that grants her emotions. An episode bundled with the limited edition of manga volume ten. The third season of Ai Mai Mi. The second season of Nanbaka. The third movie in a trilogy of movies adapting Isin Nisio's Monogatari light novels. As an overweight child, Makabe Masamune was mercilessly teased and bullied by one particular girl, Adagaki Aki. Determined to one day exact his revenge upon her, Makabe begins a rigorous regimen of self-improvement and personal transformation. Years later, Masamune re-emerges as a new man. Handsome, popular, with perfect grades and good at sports, Masamune-kun transfers to Aki's school, and is unrecognizable to her. Now, Masamune-kun is ready to confront the girl who bullied him so many years ago and humiliate her at last. But will revenge be as sweet as he thought? The story centers on a young man named Yuu Haruna who has just switched schools. He's a bit shy, and he's constantly glued to his smartphone so he can check Twitter. He meets a girl named Fuuka Akitsuki, who doesn't even have a cell phone, is free-spirited, and naturally fascinates others. Yuu recently has been getting back in touch via Twitter with his childhood friend Koyuki Hinashi, who is now a popular singer. One day Yuu invites Fuuka to one of Koyuki's concerts, and there the three meet for the first time. The story follows the love triangle between a love that started through electronics, and a love that didn't start through electronics. 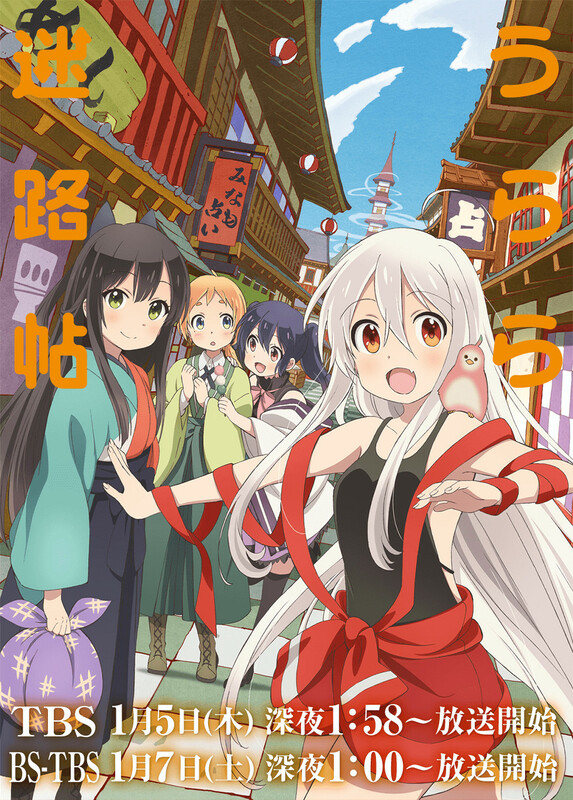 The story is set in Meiro-chou, a town where all-female diviners (uranaishi) live and where girls from all over the country yearn to become the top diviner â€” "Urara." Today, a solitary girl named Chiya enters the town's gates. However, she has another purpose coming here, besides becoming the Urara. 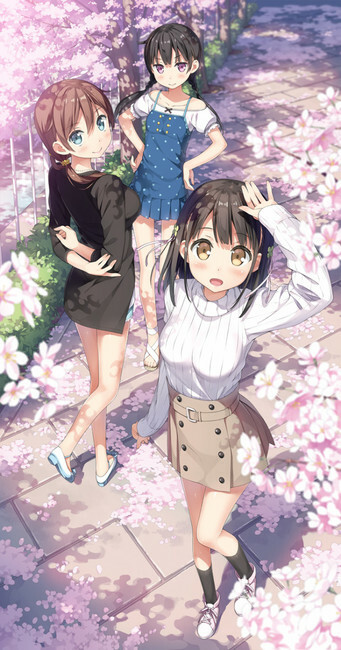 Chiya's days as an apprentice diviner begin as she meets three friends â€” the earnest Kon, Koume who is a fan of Western culture, and the shy Nono. Succubus, Dullahan and Vampire. They are known as Ajin, or "demi"s and are slightly different than the average human. They have lived alongside humans for ages under persecution. However, in recent years, they have become accepted as members of society. This manga follows a high school biology teacher who has a great interest in demis and his interaction with the various demis in his school, each with their own cute problems. The second of two Koutetsujou no Kabaneri compilation films. The second season of Reikenzan: Hoshikuzu-tachi no Utage. Genres/Themes: Part of MAGESâ€™ multimedia â€œIdol Jihenâ€ project. The show's story revolves around Akko, who as a child watched the witch Shiny Chariot perform a show, and from then on dreamed of becoming a witch. She enters the Luna Nova Academy, a school for witches that Shiny Chariot attended. In this new town she meets new friends and starts a new school life. At the school she has lessons on riding brooms and the wonder of magic, but Akko and her friends Lotte and Sucy keep getting wrapped up in tumultuous events. The four-panel manga follows a shy girl named Tomoko who comes home from school and is greeted by her three (personified) cats. Sorey is a human youth who grew up among the â€œseraphimâ€ (tenzoku), spiritual beings not visible to humans. Sorey believes in the folklore that says â€œlong ago, every human was able to see the seraphimâ€ and dreams of unraveling the ancient mystery to make the world a place where people and seraphim can live together in peace. The comedy follows Gabriel White, who graduated at the top of the class at angel school and attends a human school on earth in pursuit of knowledge, but then gets engrossed in a web game and decides its too much trouble to go anywhere. The third season of Yowamushi Pedal. The kingdom of Dowa, which is subdivided into 13 states, is celebrating its monarch's 99th birthday. These 13 states have many agencies that are controlled by the giant organization known as ACCA. Within ACCA, Jean Otis is the second-in-command of the inspection agency. His agency has ten people placed in each of the 13 states, with a central office in the capital city. They keep track of all the activities of ACCA across the kingdom, and keep data on each state's ACCA office flowing toward the central office. Jean also often has business trips from the capital to the other districts to check on the situation and personnel there. Adaptation of the spin off manga, Chiruran: Nibun no Ichi. 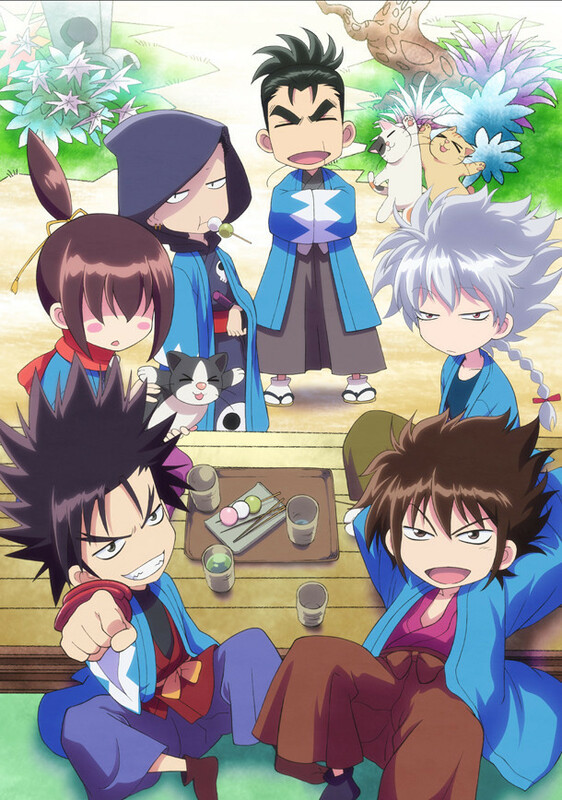 It follows the everyday lives of the members of the Shinsengumi, who are depicted in SD form. The anime takes place in Osaka in "AD20XX," and revolves around the Hand Shakers â€” partners who can summon "Nimrodes," weapons born from their deep psyche by joining hands. In order to grant the pair's wish, the Hand Shakers compete with and fight other Hand Shaker pairs. The top pair will then meet and challenge "God." The historical novel series depicts HeizÅ Hasegawa, who metes justice on wrongdoers and supervises the crackdown on arsonists and robbers in Japan's Edo period (1603-1868). 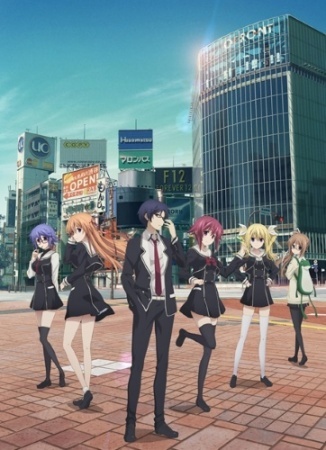 In the original visual novel, after a magnitude-7.8 earthquake hits Tokyo's Shibuya ward on November 6, 2009, a black fire spreads and causes mass panic on the day of the earthquake. The sudden disaster that becomes known as the "Shibuya Earthquake" kills 3,851 people and injures 30,927 more. Miss Kobayashi is your average office worker who lives a boring life, alone in her small apartmentâ€“until she saves the life of a female dragon in distress. The dragon, named Tohru, has the ability to magically transform into an adorable human girl (albeit with horns and a long tail! ), who will do anything to pay off her debt of gratitude, whether Miss Kobayashi likes it or not. With a very persistent and amorous dragon as a roommate, nothing comes easy, and Miss Kobayashi's normal life is about to go off the deep end! The anime follows the Marginal#4 idol unit, who made their debut at Pythagoras Production on February 13. The members give their all for their fans in their idol activities, but they are also normal high school students. The anime will follow both their everyday lives as high school students and their lives as idols. The second movie of the Chain Chronicle series. Second season of Rewrite, covering the Moon and Terra routes. A next generation Girls Band Project which links characters with real live performances! BanG Dream! is a media mix project featuring animation music videos, comics, song releases, and many more. What's more, the voice cast for the characters of BanG Dream! will also hold real live performances as the Girls Band, â€œPoppinâ€™Partyâ€. The film adapts the "GÅka Kyakusen" (luxury liner) arc, which appeared in the 11th through 14th volumes of the original manga. The story is set on the luxury liner Campania and centers around secrets to resurrecting the dead. The fourth episode in the eight episode series. elDLIVE (Studio Pierrot) - 01/?? Granblue Fantasy: The Animation (A-1 Pictures) - 01/?? Video game developer Cygames announced during the Tokyo Game Show event on Thursday that its Granblue Fantasy smartphone game will receive an anime adaptation. One Room (Typhoon Graphics) - 01/?? The series will tell "three stories raised in your (one) room." A two-part special based on Studio Khara's Nihon Animator short "Ryuu no Haisha". SCHOOLGIRL STRIKERS Animation Channel (J.C. Staff) - 01/?? 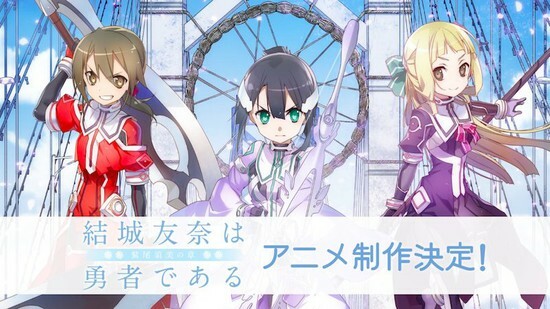 An adaptation of Square Enix's smartphone "light novel-style RPG" app Schoolgirl Strikers. 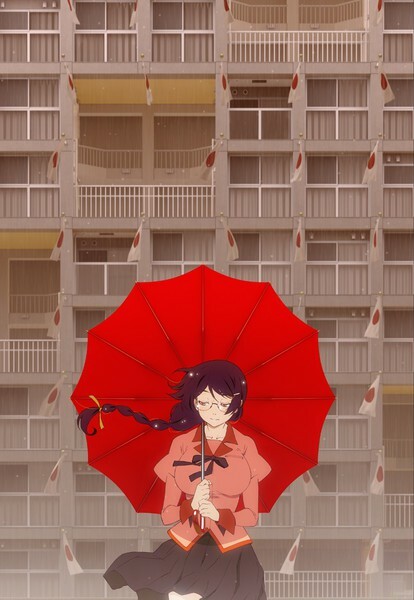 The game is set in GoryÅkan Academy, a new private senior/junior high school for girls with a vast downtown campus. This highly popular school has "another face" â€” a secret hidden side. It organizes and trains the special unit Fifth Force to protect the world from invisible supernatural entities known as "Oburi" that are devouring the world. A team of five trained with powers against the Oburi is to be chosen from the student body to perform missions. A new team leader has been appointed to assemble the five students. Youjo Senki (Studio NuT) - 01/?? The war on terror exploded, literally, the day Sarajevo was destroyed by a homemade nuclear device. The leading democracies have transformed into total surveillance states, and the developing world has drowned under a wave of genocides. The mysterious American John Paul seems to be behind the collapse of the world system, and itâ€™s up to intelligence agent Clavis Shepherd to track John Paul across the wreckage of civilizations and to find the true heart of darknessâ€”a genocidal organ. Part two of three of the prequel series Mahou Tsukai no Yome: Hoshi Matsu Hito. Chise Hatori, 15 years old. Lost, without hope, and without family, she is bought for money â€“ not by another person, but by a non-human sorcerer named Elias. Though she hesitates, she begins life anew as his apprentice and future wife. She moves on with her new and peaceful life, slowly but surely, until one day, when she finds a Japanese picture book among the many sent to her from London by Angelica. It is a fateful book that discovered her in her younger years, when she was still troubled and lonely. This piece is a prequel to Chiseâ€™s encounter with the Thorn Sorcere. An unaired episode that has been bundled with the limited edition of the eighth manga volume. It's just a game, or so I thought. People everywhere were enjoying a new game called Ordinal Scale, an ARMMORPG developed exclusively for the Augma, a new wearable console designed for AR (augmented reality) gaming. But, the players had no idea that a nightmare from the virtual world was starting to spread into reality!! As his fellow players find themselves in danger, the hero is called upon once again. The fifth episode in the eight episode series. The uneventful but subtly humorous daily lives of three girls who have just entered high school. Yuzuko is an intelligent airhead. Yukari is a loopy airhead. Yui is the mature and stable heart of the group. The other two girls depend on Yui, and she adores them in return. Teacher Miss Matsumoto, whom they call "Mother," sets them up in a tiny room with two computers and a whiteboard as the school's Data Processing Club. An original anime bundled with the manga's 29th volume. The first film of a seven-part sequel project to the television series. The film will follow Morikawa Kokone, a high school girl who encounters a strange robot named Hearts. The first movie in the Washio Sumi no Shou trilogy. A spinoff from Yuuki Yuuna wa Yuusha de Aru. Follows the titular Yuuki Yuuna and the other Hero Club members' everyday lives. This is looking like its going to be a pretty entertaining season. Ao no Exorcist stands at the top of my most wanted list, as I've been waiting so long for it. There's a ton of great OVA's this season too which is new. Last edited by FAT4LS; 12-17-2016 at 08:57 AM. Aww...Strike the Blood and Fate/ are OVA only :( I hope it would be atleast 12 episode series. Ao no exorcist really seem promising!! i am really excited to watch it. 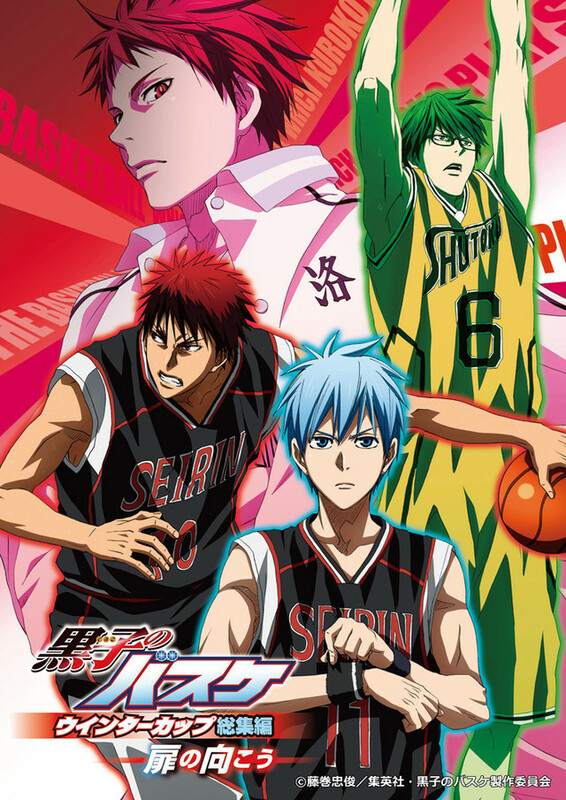 will rewatch the series again after i watch my line up of animes!! Of course I'm super psyched for Ao No Exorcist, and really interested in Masamune kun Revenge, but what I'm REALLY here for is all the Ancient Magus' Bride (Mahou Tsukai no Yome). I absolutely have LOVED the manga since the moment it came out and follow it the best I can. Youjo Senki oh god just from her eyes u'll know she's going to be psycho b!tch gonna wait for this one also. Nice I've been longing for more konosuba episodes when I finished watching 1st season. Finally the wait is almost over. STILL WAITING FOR THE NEW SEASON OF CODE GEASS R3 ? MAYBE? IM NOT SURE THOUGH ILL JUST WAIT HERE TILL SOMEONE UPLOADED IT HERE ON OS..!!!! Copied all these animes and will watch them within this year.